Peter Rindlisbacher, CSMA -- Front Cover - Check Mate! Peter Rindlisbacher was born in Windsor, Ontario. Son of a boat builder and a commercial artist, he developed an intense early passion for everything nautical, becoming a racing sailor, model builder and historical naval re-enactor. In the midst of obtaining a Ph.D. in Psychology in the 1980's, his marine art career developed into its present full time status. His paintings are mainly in oils and generally feature Great Lakes and War of 1812 subjects. Museums and historic sites in the U.S. and Canada have purchased many of his paintings, while print editions of his work are sold as fundraisers for historic groups. He enters few shows, preferring private commissions instead, largely to the U.S. market. His images have appeared on book and magazine covers, and in video and Public Television productions such as The History Channel and National Geographic. 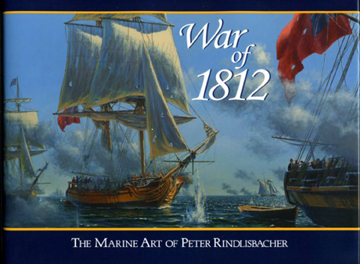 Peter's international reputation as an artist of the War 1812 era is celebrated in his new book, War of 1812: The Marine Art of Peter Rindlisbacher. This battle was one of a series of exchanges between two historic titans for control of Canada’s lucrative fur trade. At dawn near the mouth of the Hayes River, on September 5th, 1697, the French ship Pelican (44 guns), commanded by Pierre Le Moyne D’Iberville, encountered an English squadron consisting of Hampshire (46 guns), Dering (36 guns) and Royal Hudson Bay (32 guns). The Pelican initially thought these ships were French, but when found to be the enemy, she steered for them nevertheless. The wind was brisk from the West-South-West, and the firing began at 9:30 AM. The painting shows the ships steering South-East at the height of the battle about mid-day. The Hampshire and Pelican are shown exchanging broadsides at close quarters, with Dering close behind, and Royal Hudson Bay’s topsails just visible in the battle smoke between the two lead ships. The French ship flies the white “ancient regime” flag of France, while the English shown the Royal Union flag, in use until 1801. The low shoreline of present-day Manitoba is far distant. Shortly after this moment, for reasons still unclear, the Hampshire suddenly capsized and sank. The Royal Hudson Bay surrendered, and the Dering was able to elude the Pelican in a subsequent chase. No survivors of the Hampshire were recovered afterwards. The Pelican was abandoned as a result of her battle damage, but the French went ashore and captured York Factory on September 13th, holding it for the next 16 years.